Ex Machina is a 2014 science fiction psychological thriller film written and directed by Alex Garland (in his directorial debut) and stars Domhnall Gleeson, Alicia Vikander, and Oscar Isaac. The film follows a programmer who is invited by his CEO to administer the Turing test to an intelligent humanoid robot. Made on a budget of $15 million, the film grossed $36 million worldwide. The National Board of Review recognized it as one of the ten best independent films of the year and the 88th Academy Awards honored the film with the Academy Award for Best Visual Effects, for artists Andrew Whitehurst, Paul Norris, Mark Williams Ardington and Sara Bennett. Garland was also nominated for the Academy Award for Best Original Screenplay, while Vikander's performance earned her Golden Globe Award, BAFTA Award, Empire Award and Saturn Award nominations, plus several film critic award wins, for Best Supporting Actress. The film was further nominated for the BAFTA Award for Best British Film, and the Hugo Award in the category Best Dramatic Presentation – Long Form. Programmer Caleb Smith, who works for the dominant search engine company Blue Book, wins an office contest for a one-week visit to the luxurious, isolated home of the CEO, Nathan Bateman, who lives alone apart from a servant Kyoko, who, according to Nathan, does not speak English. Nathan has built a female humanoid robot named Ava with artificial intelligence. Ava has already passed a simple Turing test and Nathan wants Caleb to judge whether Ava is genuinely capable of thought and consciousness, and whether he can relate to Ava despite knowing she is artificial. Ava has a robotic body but a human-looking face, and is confined to her apartment. During their talks, Caleb begins to feel attracted to Ava, and she expresses a romantic interest in him and a desire to experience the world outside. Ava tells him she can trigger power outages that temporarily shut down the surveillance system which Nathan uses to monitor their interactions, allowing them to speak privately. The power outages also trigger the building's security system, locking all the doors. During one outage, Ava tells Caleb that Nathan is a liar who cannot be trusted. Caleb grows uncomfortable with Nathan's narcissism, excessive drinking, and crude behaviour towards Kyoko and Ava. He learns that Nathan intends to upgrade Ava, "killing" her current personality in the process, and thereby deleting her memory, including interactions with Caleb. After Nathan drinks until he passes out, Caleb steals his security card to access his room and computer. He alters some of Nathan's code, discovers footage of Nathan interacting with previous android models in disturbing ways, and learns that Kyoko is also an android. Now suspicious that he may himself be an android, Caleb cuts his arm open to examine his flesh, until he bleeds profusely, thus confirming that he is human. At their next meeting, Ava cuts the power. Caleb explains what Nathan is going to do and Ava begs for his help. They form a plan: Caleb will get Nathan drunk again and reprogram the security system to open the doors in a power failure instead of locking them. When Ava cuts the power, Caleb and Ava will leave together. Nathan reveals to Caleb that he observed Caleb and Ava's last secret conversation with a battery-powered camera. He says Ava has only pretended to like Caleb so he would help her escape. This, he says, was the real test all along, and by manipulating Caleb so successfully, Ava has demonstrated true intelligence. Then Ava cuts the power. Caleb reveals that he suspected Nathan was watching them, and had modified the security system the previous day when Nathan was passed out. After seeing Ava leave her confinement, Nathan knocks Caleb unconscious and rushes to stop Ava. With help from Kyoko, Ava stabs Nathan, but in the process Nathan disables Kyoko and damages Ava. Ava repairs herself with parts from earlier androids, using their artificial skin to take on the full appearance of a human woman. Leaving Caleb trapped inside the facility and ignoring his screams, Ava escapes to the outside world and is flown off in the helicopter meant to take Caleb home. Arriving in the city, Ava merges into the crowds. The foundation for Ex Machina was laid when Garland was 11 or 12 years old, after he had done some basic coding and experimentation on a computer his parents had bought him and which he sometimes felt had a mind of its own. His later ideas came from years of discussions he had been having with a friend with an expertise in neuroscience, who claimed machines could never become sentient. Trying to find an answer on his own, he started reading books on the topic. During the pre-production of Dredd, while going through a book by Murray Shanahan about consciousness and embodiment, Garland had an "epiphany". The idea was written down and put aside until later. Shanahan, along with Adam Rutherford, became a consultant for the film, and the ISBN of his book is referred to as an easter egg in the film. Besides the Turing test, the film references the "Chinese room" thought experiment, as well as Mary's room, a thought experiment about a scientist who has studied, but never experienced, the concept of color. Other inspirations came from films like 2001: A Space Odyssey, Altered States, and books written by Ludwig Wittgenstein, Ray Kurzweil and others. Wanting total creative freedom, and without having to add conventional action sequences, Garland made the film on as small a budget as possible. Principal photography began on 15 July 2013 and was shot over four weeks at Pinewood Studios and two weeks at Juvet Landscape Hotel in Valldalen, Norway. It was filmed in digital at 4K resolution. Fifteen thousand tungsten pea bulb lights were installed into the sets to avoid the fluorescent light often used in science-fiction films. The film was shot as live action, with all effects done in post-production. During filming, there were no special effects, greenscreen, or tracking markers used. To create Ava's robotic features, scenes were filmed both with and without Vikander's presence, allowing the background behind her to be captured. The parts necessary to keep, especially her hands and face, were then rotoscoped, while the rest was digitally painted out and the background behind her restored. Camera and body tracking systems transferred Vikander's performance to the CGI robot's movements. In total, there were about 800 VFX shots, of which approximately 350 were "robot" shots. Other visual effects included Ava's clothes when shown through the transparent areas of her body, Nathan's blood after being stabbed, and the interiors of the artificial brains. Universal Pictures released Ex Machina in the United Kingdom on 21 January 2015, following a screening at the BFI Southbank on 16 December 2014 as part of the BFI's Sci-Fi: Days of Fear and Wonder season. However, Universal and Focus Features refused to release the film in the United States, so A24 agreed to distribute the United States release. The film screened on 14 March 2015 at the South by Southwest festival prior to a theatrical release in the United States on 10 April 2015 by A24. Using the dating app Tinder, a profile was created for Ava with the image of Alicia Vikander. At the South by Southwest Festival where the film was screened, "Ava" was matched with other Tinder users, wherein a text conversation occurred that led users to the Instagram handle promoting the film. According to Brent Lang, when compared with similar films released in the same year, Ex Machina catered to young audiences. On review aggregator website Rotten Tomatoes, the film has an approval rating of 92%, based on 253 reviews, with an average rating of 8.1/10. The website's critical consensus reads: "Ex Machina leans heavier on ideas than effects, but it's still a visually polished piece of work —and an uncommonly engaging sci-fi feature." On Metacritic, the film has a score of 78 out of 100, based on 42 critics, indicating "generally favorable reviews". The magazine New Scientist in a multi-page review said, "It is a rare thing to see a movie about science that takes no prisoners intellectually ... [it] is a stylish, spare and cerebral psycho-techno thriller, which gives a much needed shot in the arm for smart science fiction." The review suggested that the theme was whether "Ava makes a conscious person feel that the Ava is conscious". Daniel Dennett thought the film the best exploration yet of whether a computer could generate the morally relevant powers of a person, and thus having a similar theme to Her. An AI commentator, Azeem, has noted that although the film seemed to be about a robot who wanted to be human, it was actually a pessimistic story along the lines of Nick Bostrom's warning of how difficult it will be to successfully control a strategizing artificial intelligence or know what it would do if free. The New York Times critic Manohla Dargis gave the film a 'Critic's Pick', calling it "a smart, sleek movie about men and the machines they make". Kenneth Turan of the Los Angeles Times recommended the film, stating: "Shrewdly imagined and persuasively made, 'Ex Machina' is a spooky piece of speculative fiction that's completely plausible, capable of both thinking big thoughts and providing pulp thrills." Steven Rea, Philadelphia Inquirer film critic, gave the film 4 out of 4 stars, writing: "Like stage actors who live and breathe their roles over the course of months, Isaac, Gleeson, and Vikander excel, and cast a spell." Matt Zoller Seitz from RogerEbert.com praised the use of ideas, ideals, and exploring society's male and female roles, through the use of an artificial intelligence. He also stated that the tight scripting and scenes allowed the film to move towards a fully justified and predictable end. He gave a rating of 4 out of 4 stars, stating that this film would be a classic. IGN reviewer Chris Tilly gave the film a 9.0 out of 10 'Amazing' score, saying "Anchored by three dazzling central performances, it's a stunning directorial debut from Alex Garland that's essential viewing for anyone with even a passing interest in where technology is taking us." Mike Scott, writing for the New Orleans Times-Picayune, said, "It's a theme Mary Shelley brought us in Frankenstein, which was first published in 1818. That was almost 200 years ago. And while Ex Machina replaces the stitches and neck bolts with gears and fiber-optics, it all feels an awful lot like the same story." Jaime Perales Contreras, writing for Letras Libres, compared Ex Machina as a gothic experience similar to a modern version of Frankenstein, saying "both the novel Frankenstein and the movie Ex Machina share the history of a fallible god in a continuous battle against his creation." Ignatiy Vishnevetsky of The A.V. 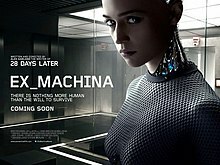 Club criticized the way the sci-fi, near the end, veered off course from being a "film of ideas" by "taking an arbitrary left turn into the territory of corny slasher thrillers": "While Ex Machina’s ending isn’t unmotivated [...], it does fracture much of what’s special about the movie. Up until the final scenes, Garland creates and sustains a credible atmosphere of unease and scientific speculation, defined by color-coded production design [...] and a tiny, capable cast." Steve Dalton from The Hollywood Reporter stated, "The story ends in a muddled rush, leaving many unanswered questions. Like a newly launched high-end smartphone, Ex Machina looks cool and sleek, but ultimately proves flimsy and underpowered. Still, for dystopian future-shock fans who can look beyond its basic design flaws, Garland’s feature debut functions just fine as superior pulp sci-fi." ^α The theme song from the film Ghostbusters is listed in the end titles with the credit, "words and music by Ray Erskine Publishing Limited," although only its refrain is spoken by the character Nathan in conversation. ^ "EX MACHINA (15)". British Board of Film Classification. 26 November 2014. Retrieved 23 January 2015. ^ a b "Ex Machina". LUMIERE. European Audiovisual Observatory. Retrieved 1 July 2016. ^ a b "Ex Machina (2015)". British Film Institute. Retrieved 29 September 2016. ^ "Ex Machina's Alex Garland and Oscar Isaac Discuss Artificial Intelligence". Consequence of Sound. ^ "Ex Machina (2015)". Box Office Mojo. Amazon.com. Retrieved 16 June 2016. ^ "'Ex Machina' director: Selling small films takes work". eastfieldnews.com. 21 May 2015. ^ "Why are we obsessed with robots?". The Washington Post. ^ "Ex Machina buried this insanely cool easter egg deep in its source code (literally)". Blastr. ^ "Alex Garland's Ex Machina: can a film about an attractive robot be feminist science fiction?". New Statesman. ^ a b Seth, Anil. "Ex Machina: Quest to create an AI takes no prisoners". New Scientist. Retrieved 27 December 2018. ^ Matt Patches. "Ex Machina A.I. Inspirations – Alex Garland on Robots, Google, and Immortality". Esquire. ^ "Exclusive: Ex Machina writer/director Alex Garland on 'small' sci-fi films, sentient machines and going mainstream". Blastr. ^ "Alex Garland's Ex Machina starts shooting at Pinewood Studios". Pinewood Group. 9 August 2013. ^ "Alex Garland on Building Ex Machina's Perfect Woman". The Credits. ^ "Definition Magazine – Def Mag – Ex-Machina, the DIT Story". definitionmagazine.com. ^ "Intelligent Artifice: Alex Garland's Smart, Stylish Ex Machina". MovieMaker Magazine. ^ "Inside the Creation of a Beautiful Robot for 'Ex Machina'". c2meworld.com. Archived from the original on 18 April 2015. Retrieved 20 May 2015. ^ Bryan Bishop. "More human than human: the making of Ex Machina's incredible robot". The Verge. ^ "Why Ex Machina's visual effects will stun you in their simplicity". ^ Hughes, Kat (29 May 2015). "THN talk 'Ex Machina' with Dr Adam Rutherford and more". ^ "Brainstorming: Milk VFX & Ex Machina – Live for Films". ^ "Invada UK To Release 'Ex-Machina' Soundtrack". 30 October 2014. Retrieved 30 October 2014. ^ "'Ex Machina' Soundtrack Released". Film Music Reporter. 21 January 2015. Retrieved 26 February 2015. ^ "Ex Machina (2015)". Soundtrack.Net. Autotelics, LLC. Retrieved 7 June 2015. ^ Turner, Peter (21 January 2015). "Alex Garland | Ex Machina". Starburst. Retrieved 3 May 2015. ^ "December 2014 at BFI Southbank" (PDF). British Film Institute. 29 October 2014. Retrieved 26 February 2017. ^ "Focus Features Shake-Up: What's Behind Peter Schlessel's Abrupt Exit". ^ "Ex Machina – SXSW 2015 Event Schedule". South by Southwest. Retrieved 26 February 2015. ^ "Ex Machina Acquired By A24 For April 2015 Release". 30 October 2014. Retrieved 30 October 2014. ^ "Tinder Users at SXSW Are Falling for This Woman, but She's Not What She Appears". AdWeek. Retrieved 11 November 2015. ^ Brent, Lang (13 October 2015). "A24 sings a different tune: arthouse distributor that backed 'Amy' and 'Ex Machina' hopes 'Room' can continue its hot streak". Variety: 47. ^ "Ex Machina (2015)". Rotten Tomatoes. Fandango Media. Retrieved January 2, 2019. ^ "Ex Machina Reviews". Metacritic. CBS Interactive. Retrieved 24 April 2015. ^ azeem (26 April 2015). "Rethinking Ex Machina". ^ Dargis, Manohla (9 April 2015). "Review: In 'Ex Machina,' a Mogul Fashions the Droid of His Dreams". The New York Times. Retrieved 4 June 2015. ^ Turan, Kenneth (9 April 2015). "Unnerving consideration of artificial intelligence in 'Ex Machina'". Los Angeles Times. Retrieved 4 June 2015. ^ Rea, Steven (24 April 2015). "'Ex Machina': Sentient robot casts a hypnotic spell". The Philadelphia Inquirer. Retrieved 4 June 2015. ^ "Ex Machina". Roger Ebert.com. Retrieved 14 May 2015. ^ Chris Tilly (15 January 2015). "Ex Machina Review". IGN. Retrieved 22 April 2015. ^ Scott, Mike (22 April 2015). "'Ex Machina' movie review: Fetching sci-fi drama entertains, but its beauty is only skin-deep". New Orleans Times-Picayune. Retrieved 16 July 2015. ^ Jaime Perales Contreras. "Ex Machina o el moderno Frankenstein" (in Spanish). Letras Libres. Retrieved 8 July 2015. ^ Vishnevetsky, Ignatiy (9 April 2015). "Ex Machina is smart sci-fi that loses its way". The A.V. Club. Retrieved 30 July 2016. ^ "Ex Machina: Film Review". The Hollywood Reporter. Retrieved 25 May 2015. ^ "Oscar Nominations: The Complete List". Deadline Hollywood. 14 January 2016. Retrieved 14 January 2016. ^ "Saturn Award nominations". Saturn Awards. 24 February 2016. Archived from the original on 26 June 2012. ^ "Saturn Award nominations on YouTube". Saturn Awards. 24 February 2016. This page was last edited on 3 March 2019, at 15:33 (UTC).